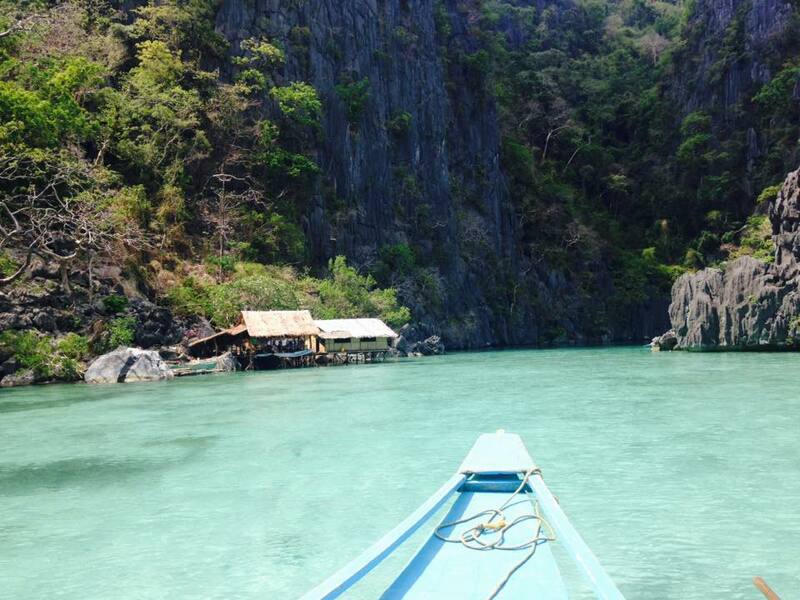 So last week we spend our spring break in Philippines. That was really an amazing experience full of news adventures, let me tell you why! First we travelled in really funny and unbelievable way from boat to tricycle, tuk tuk and minivan. We first arrived in Manilla and then we took a huge ferry boat during 15 hours, hopefully for us there were some bunk bed and food to help us getting through the travel. 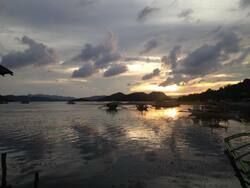 We finally arrive in Coron, a beautiful town in the Palawan Island. This town is known for its wonderful seabed full of multicolour fish and coral. 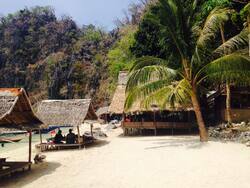 For 4 days we could enjoyed it by doing snorkelling and boat tours. That was really breath-taking and the landscape were beautiful. During these 4 days we met of lot of amazing Philippians people. 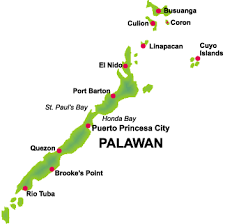 I was really surprised to discover how the Philippians were nice and welcoming, on day we were on the beach and a Philippians family invited us to join them to lunch, they gived us some plates and gived us the food that they cooked on the morning. They shared everything spontaneously and generously. 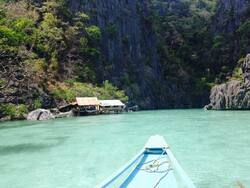 After those 4 days we took a kind of speed boat to go to El Nido, another town in Palawan Island. This ride was the most hard in my life because we have been taken into a sea storm so the boat moved a lot and half of the passengers were sick. But now it past I will keep a funny memory of its adventure! 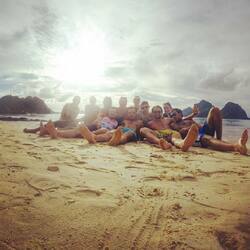 In El Nido we met some of our Shanghai Friends and some of our friend who studied in Seoul and in Suwon in South Korea so it was nice to be all together in the same place for holiday. 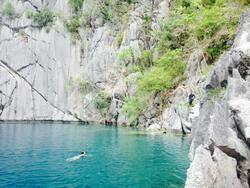 El Nido offers a lot of activities like boat tours, biking or snorkelling but the best in El Nido is the beach. I think I have never seen such beautiful landscape before with so many coconut, hammock and white sand, in one word: the DREAM. The night we could enjoy the sunset and the warm form restaurants and bars on the beach, that was a really cool atmosphere. I really enjoy this trip, for the beauty of the landscape, the islands for the sun, the warm and finally for having the chance to be reunited with my friends to share this experience. Now I’m back in Shanghai for my last month in University so I am going to try to enjoy it at 100% !! 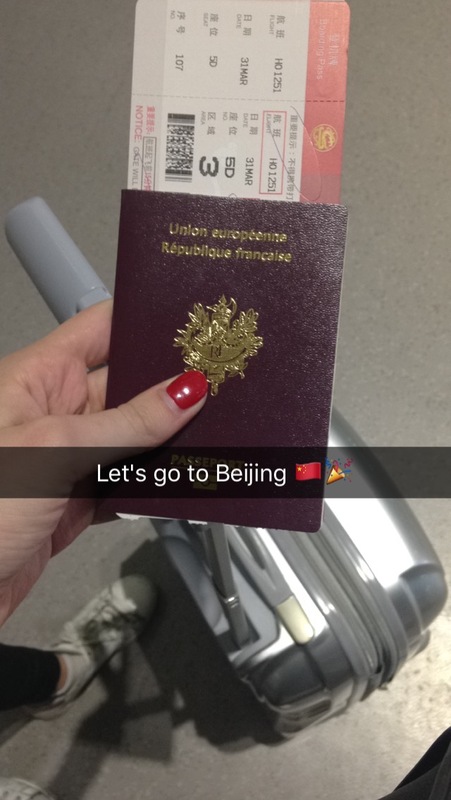 It’s been now 3 weeks that I have been to Beijing with my 4 flatmates and I decided to write an article on this little trip of 4 intense days full of discovery and visits. 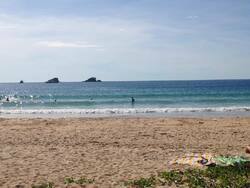 For the first day we had the chance to enjoy beautiful sunshine and pleasant temperatures. We first went towards the temple of heaven. The Temple of Heaven is a complex of religious buildings located in the south-eastern part of central Beijing in the historic district of Xuanwu. 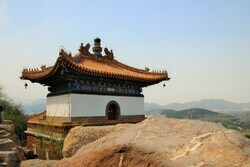 It is considered as the completion of traditional Chinese architecture. His disposition is a symbol of the Chinese belief, so the basis of the park is square, like the Earth, while the top is round at the image of the sky. At the time, the emperor was considered as the “son of heaven”, responsible for the link with the heavenly authority to maintain good order on earth and good harvest. Thus sacrifice ceremonies practiced in many temples of the park were very important. After a long walk in this park of 267 hectares we went to the famous Forbidden City. 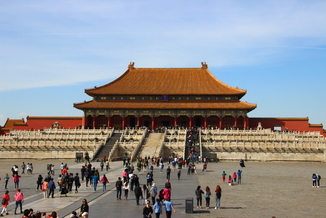 The Forbidden City was the imperial palace in Beijing Imperial City whose construction was ordered by Yongle, third emperor of the Ming Dynasty. 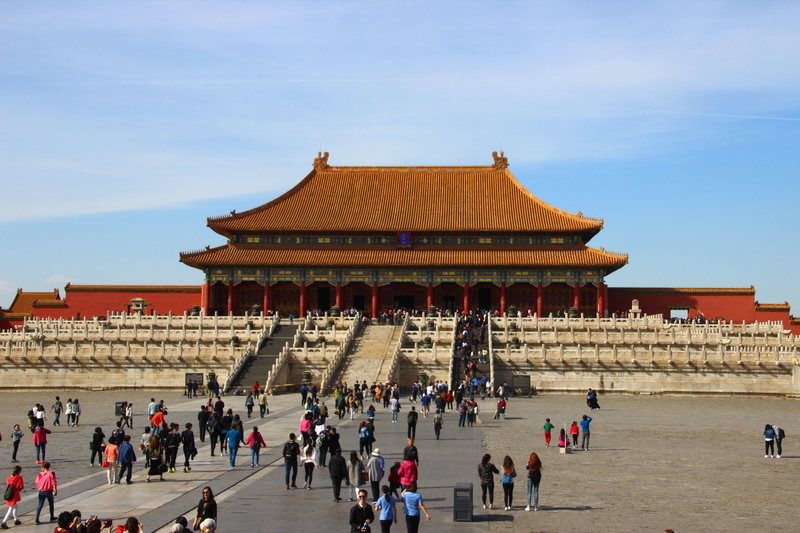 The most common foreign name is "Forbidden City", which comes from the fact that as the residence of the Chinese emperors, their families and those in their service, its access was forbidden to the people. 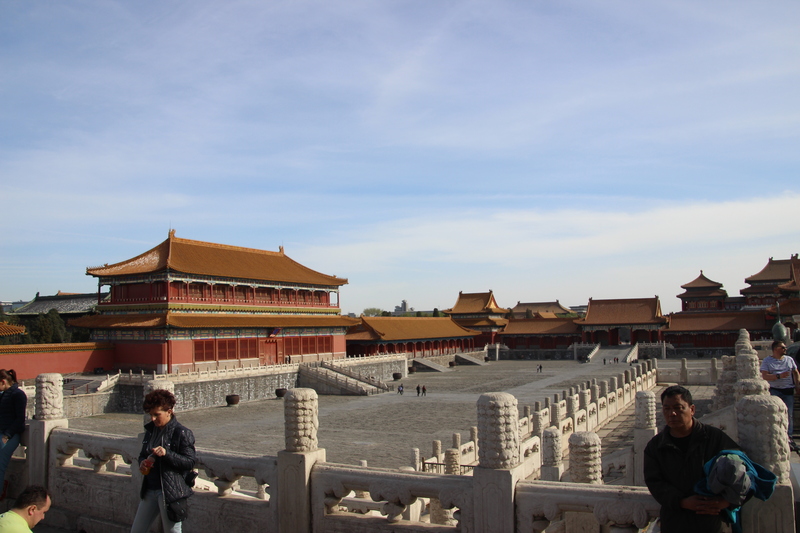 Also called Imperial Palace of the Ming and Qing. 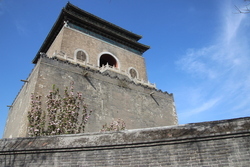 It is a real city within the Imperial City, in which the Emperor of China and his entourage were practically under house arrest, only coming out in very rare occasions. 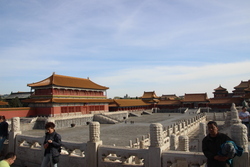 The Forbidden City covers an area of ​​72 hectares and is surrounded by a wall of 10 meters high and 6 meters wide, itself ringed by a wide moat of 52 meters, which is accessible by four doors. The construction of the Forbidden City lasted 14 years from 1406 to 1420 and more than one million workers enslaved have worked there. Feeling of the day: Lots of walking and visiting. We tried to see as much as we could. But these places are so huge they would take days to see everything. In the evening we went to an excellent restaurant to taste the Beijing specialty: roast duck. The waiter brought the whole roast duck and cut it in front of us, then we eat the duck with all the garnish: vegetable, rice, pancakes and sauce. That was really delicious, one of the best dish I tasted in China! The second day was spent visiting what I expected more: the Great Wall of China 长城 . After 3 long hours of bus punctuated by endless traffic jam and ½ hour of mini-van to reach the mountain we finally arrived at Mùtiányù 慕田峪. 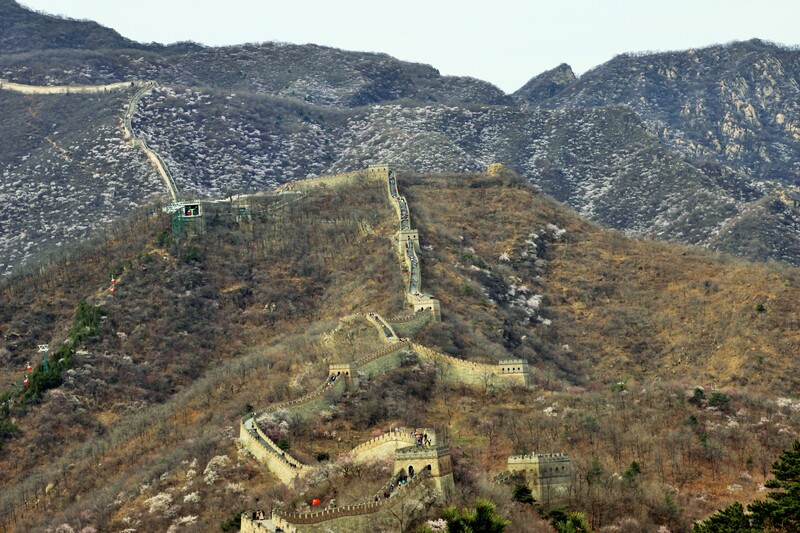 Mùtiányù is a section of the Great Wall of China located in Huairou District, at 70 km in northwest of Beijing. This section was used as a defence barrier in the north for the capital and the imperial tombs. It was built for the first time in the middle of the sixth century, in the northern Qi dynasty. 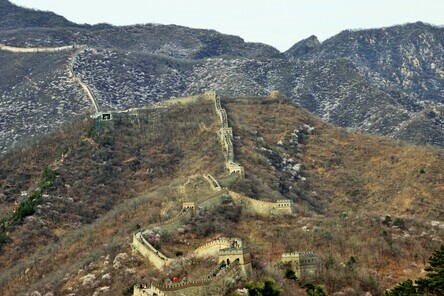 The Mùtiányù Great Wall has the largest and the better quality construction compared to all the other sectors of the Great Wall of China. Built mostly in granite, the wall is 7 to 8 meters high and its top is 4 to 5 meters wide. 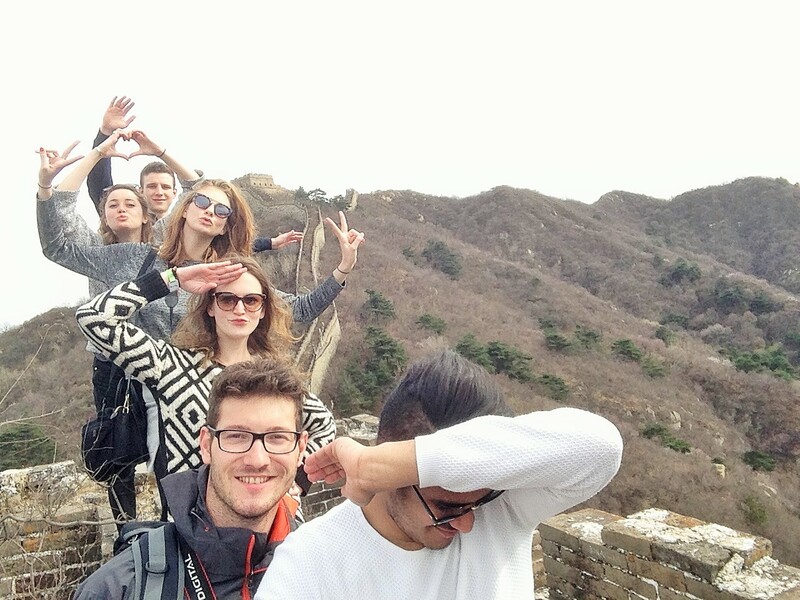 After arriving at the top of the Great wall by chairlift, we walked and climbed the many steps of the wall with an incredible views of the mountains and the forest park. At the end of the day, we chose to go down the wall by an unusual way ... in slide. It was really fun and the landscape was great. Feeling of the day: I think that was the thing that impressed me the most since I arrived in China. That was really impressive and breath-taking. I really would like to return there one day in my life. On Sunday morning we went visit the drum tower. After climbing the steep stairs that lead to the 24 drums showroom at the top of the tower, we enjoyed a drum concert. The drum tower was rebuilt in the XV century. Once, the drum rolls marked every 2 hours, dividing the day into 12 periods corresponding to the signs of the Chinese horoscope. Then, we visit the bell tower, simpler but still offers a beautiful view of the Hutong and the city of Beijing. On Sunday afternoon we went for a walk in the famous Hutong of Beijing. The hutong are an assembly of narrow passages and alleys, there we can see traditional houses opening onto various courtyards. I found the atmosphere of that place very mysterious and calm, it was quite relaxing. 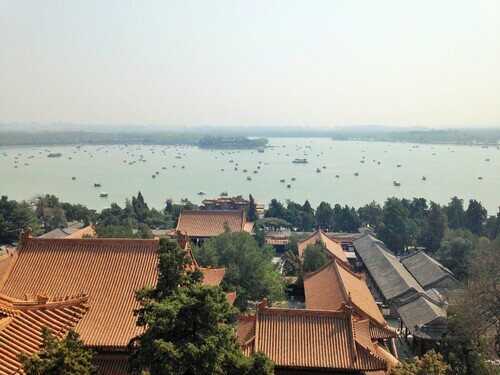 For our last day in Beijing we decided to go visit the Summer Palace, the latest “unavoidable” of our travel guide. 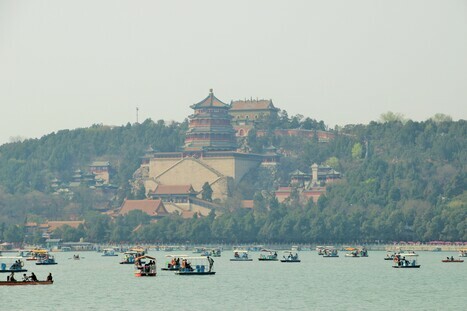 The Summer palace is located outdoors the downtown, it took 1 hour subway to get there.. 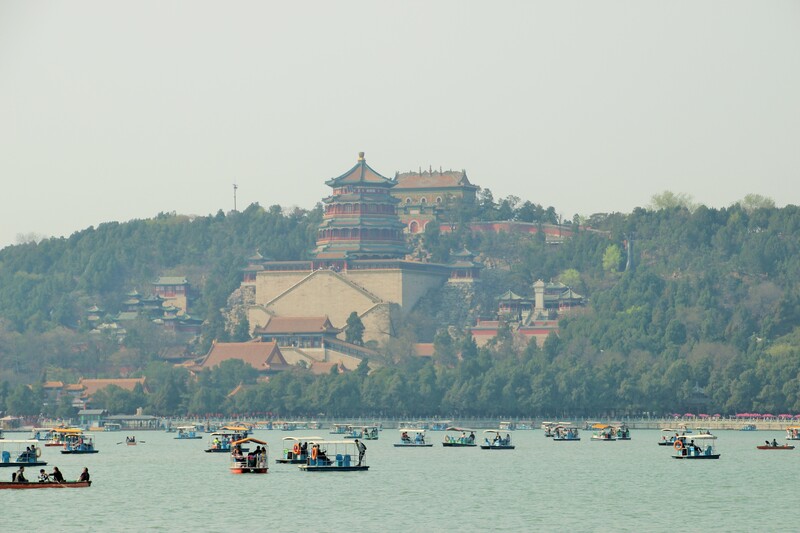 The Summer Palace is a remarkable set of gardens, pavilions, temples, galleries and bridges around the peaceful Kūnmíng Lake 昆明湖. Formerly, the Imperial Court took refuge there to escape the sweltering summers of Beijing. 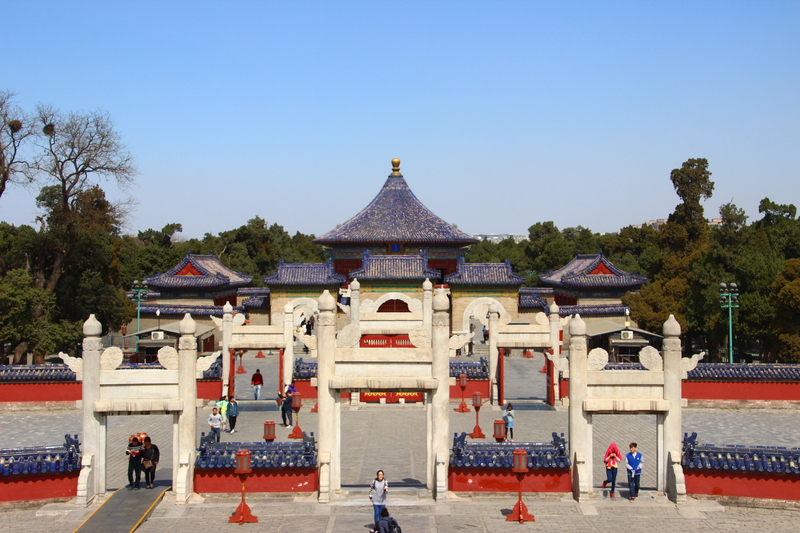 At the time, the Emperor Qianlong, the fourth of the Qing Dynasty, made great transformation of this imperial garden, indeed, everything that the imperial family wanted during his holiday was built. This travel was really enriching and amazing, I have seen things that I never thought I would ever see in my life like the Great Wall of China or the stunning edifices of the Forbidden City. I will forever keep unforgettable memories of these 4 days.